Floral therapy relies upon the of essence of flowers to treat a physical illness by treating the accompanying anxiety and apprehension that are obstacles in the path of recovery. Floral therapy is based on the concept that illness reflects a conflict between thoughts and behavior of a person. This internal war leads to mood swings and disturbs the flow of energy. A lack of harmony between the purpose of soul and personality's actions results in disease. Healing is initiated by attending to the emotions and weeding out harmful thoughts from the psyche of a person. Floral therapy was devised by the British homeopath, Edward Bach. It relies on emotional and spiritual form of healing. Bach observed that early morning sunlight passing through dew drops on the flower petals transferred the healing power of the flower onto the water. He would collect the dew drops from plants, preserve them in equal amounts of brandy to make mother tincture, and further dilute it before use. But the solution was available in meagre quantities, due to which he was not able to test the medicinal properties of individual flowers. So he devised another method in which he would suspend the flowers in spring water, and allow sun rays to pass through them. Bach's floral remedies are based on the idea that positive energy neutralizes the negative energy. Stock remedies sold in shops are a dilution of mother tincture in other liquids, usually alcohol. Bach also devised a "Rescue Remedy" from extracts of Impatiens, Clematis, Rock Rose, Star of Bethlehem and Cherry Plum. It can be used to reduce anxiety due to sudden stress at work, emergency, fear or panic during travel, shock of an accident or sudden emotional disturbances. Healers: These include Agrimony, Chicory, Gentian, Clematis, Impatiens, Mimulus, Vervain and Water Violet. Helpers: These Include Gorse, Heather, Oak, Olive, Vine and Wild Oats. Second 19: These are Aspen, Beech, Cherry Plum, Holly, Chestnut, Crab Apple, Elm, Mustard, Star of Bethlehem, Wild Rose, and Willow. Aspen: It is the remedy for any fear whose cause cannot be named. 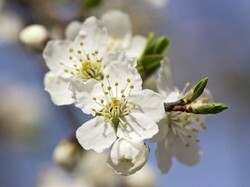 Cherry Plum: It is used to treat fear of the mind giving away. Chestnut Bud: It has benefits for those who feel that they fail to learn from their mistakes. Clematis: It is useful for people who dream of future without working in the present. Crabapple: This is a cleansing remedy for self-hatred. Elm: It helps people who are overwhelmed with responsibilities. Gentian: To cure discouragement that lingers after a setback. Gorse: It is a remedy for hopelessness and despair. Heather: For self-centeredness and self-concern. Holly: Used to reduce hatred, envy and jealousy. Honeysuckle: It has beneficial effects in people who live in the past and tend to avoid present day situations. Hornbeam: If you feel tired at the thought of doing something. Impatiens: As the name implies, it is a cure for impatience. Larch: For lack of confidence. Mimulus: For those who suffer from fear of known things. Mustard: It reduces deep gloom for no reason. Oak: It is for those people who go past the point of exhaustion. Olive: Used to treat exhaustion following a mental or physical effort. Pine: To reduce the sense of guilt. Red chestnut: For those who remain over concerned for the welfare of their loved ones. Rockrose: A remedy for terror and fright. Scleranthus: For inability to choose between alternatives. Star of Bethlehem: A remedy for shock. Sweet chestnut: For extreme mental anguish. Vine: To reduce dominance and inflexibility. Walnut: It protects from change and unwanted influences. Water violet: For people who are quiet and self-reliant to an extent that leads to isolation and loneliness. White chestnut: To reduce unwanted thoughts and mental arguments. Wild oats: To treat uncertainty. Wild rose: For drifting, apathy. Metreye, All of the flowering plants are either on or near my natural garden and yard! My favorite is chicory. What do you interpret as its overwhelming healing property? I used flower remedies, I have singles and mix them myself using Brandy and water and the drops of the correct single flowers, but it is best to start out buying them premade. It is important to get the right combination as well. Matthew Sanford was paralyzed from the chest down when he was 13. Now he is a certified Iyengar Yoga teacher and motivational speaker about the mind-body experience. Forest bathing began in Japan in 1982 for wellness outdoors even though it now belongs as nature- and people-friendly therapy elsewhere and even indoors. Learn cost cutting organic treatments cures and hacks using coconut oil that save a lot of money and can replace costly health beauty and household products.